So what are the key drivers leading to the downtown population surge profiled in the previous entry, which had been decreasing prior to the 1990s? Look at the net changes in household types over the last 25 years – 11.8M singles vs 1.4M families with kids, the latter of which only represents 4.5% of all net new households in that time period. Some other key statements from Robert’s research show that as couples get married later and have fewer children, there is a striking decrease in average household size, which of course leads to the trend in not-so-big homes. “- In 2030, about half of the buildings in which Americans live, work, and shop will have been built after 2000. – Household formation will have profoundly important impacts. 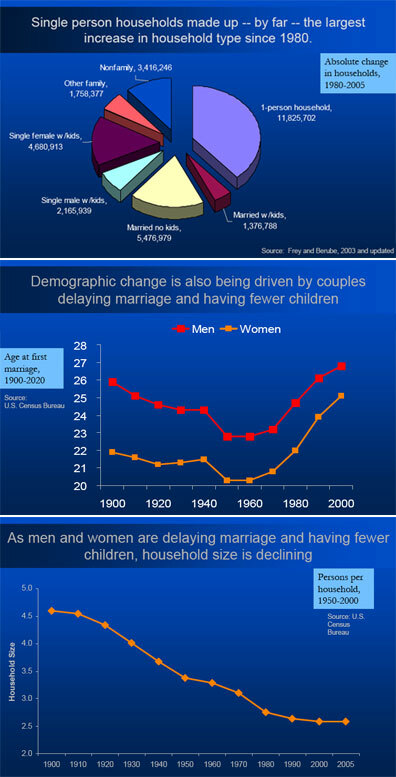 Childless married-couple and single-person households will grow rapidly. – Older, inner-ring ‘first’ suburbs will figure prominently in conversations about metropolitan growth and development.